1226 BROAD SHEET was first made in Sussex, but of poor quality, and fairly opaque. Manufacture slowly decreased and ceased by the early 16th Century. 1330 French glassmakers produced CROWN GLASS for the first time at Rouen. Some French Crown and Broad Sheet was imported into the UK. 1620 BLOWN PLATE was produced in London by grinding and polishing Broad Sheet, and was used for mirrors and Coach Plates. 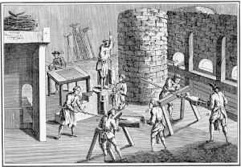 1678 CROWN GLASS was first produced in London. Because of its finer quality, this process predominated until the mid nineteenth century. 1688 The French produced POLISHED PLATE in larger sizes by casting and hand polishing. 1773 English POLISHED PLATE by the French process was produced at Ravenshead. By 1800 a steam engine was used to carry out the grinding and polishing of the cast glass. 1834 Robert Lucas Chance introduced IMPROVED CYLINDER SHEET, using a German process to produce finer quality and larger panes. This glass was used to glaze The Crystal Palace. The process was used extensively until early in the 20th Century to make window glass. From this period onwards machines were developed to automate the production of obscured Glass and later, window glass. 1847 James Hartley introduced a ROLLED PLATE glass with obscured ribbed finish, which is often found glazed in the roofs of railway termini. 1888 Chance Bros introduced MACHINE ROLLED patterned glass. 1898 Pilkingtons introduced Hexagonal Rolled WIRED CAST. 1903 MACHINE DRAWN CYLINDER Glass invented in the USA, was manufactured in the UK by Pilkingtons from 1910 to 1933. 1913 Belgium produced the first machine FLAT DRAWN SHEET glass. It was first drawn in the UK in 1919 in Kent . 1923 First UK production of continuous POLISHED PLATE glass, using single grinding system. 1938 Pilkingtons developed the twin ground POLISHED PLATE system. 1959 FLOAT GLASS was launched on the UK Market, invented by Sir Alistair Pilkington.